These two events - the taking of Babylon the Great without a battle and the magnanimous freeing of the Jews soon after - are both remarkable historical events in themselves. What makes them even more notable is the fact that God told about them in Isaiah 44:26-45:1, 13, appointing Cyrus by name 100 years before this son of Cambyses was born. The Book of Isaiah is one of the most greatly admired and beloved books of the Bible. The New Testament writers quote Isaiah more than all the other Old Testament prophets combined. From a literary point of view, the writing of Isaiah is superb, full of parallelism and euphony; scholars savor Isaiah's obvious attention to the literary art of his writing. Beyond his writing skill, Isaiah's book is filled with prophecies about Judah and the surrounding lands. It also contains a host of very important Messianic prophecies (7:14-16; 9:1-7; 11:1-16; 32:1ff; 42:1-7; 50:5-8; 52:13-15; 61:1-3; 65:17), even describing in detail Jesus' crucifixion 700 years before it happened. In Isaiah 44 and 45, God not only describes the ease with which Cyrus would enter the city with the "two leaved gates" (gates that were not even shut against the invaders!) but also notes that He would "loose the loins of kings" before Cyrus – a euphemism regarding the fear these kings would feel and the mess in their pants they'd make as a result. As a matter of fact, about the time Cyrus' men were entering the city, King Belshazzar, second in command under his father Nabonidus, was being interrupted in his feast. A hand began to write on the wall to tell Belshazzar that his time was up. Daniel 5:6 puts in not-so-delicate terms how greatly the fear of this sight affected Belshazzar, saying, "his thoughts troubled him, so that the joints of his loins were loosed, and his knees smote one against another." Who says God isn't detailed! In circles of modern liberal criticism, though, it has become popular to dismiss the idea, held for some 2500 years, that Isaiah son of Amoz wrote the entire book credited to his name. Old Testament scholars have found it fashionable to argue that there were at least two "Isaiahs", perhaps even three or more. These critics argue that it makes no sense for God to have foretold events that would not have taken place during the life of the prophet. 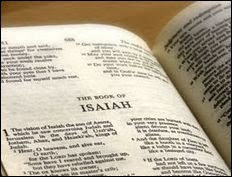 They attempt to argue that the character of God in Isaiah 1-39 is far fiercer than the gentle God of Isaiah 40-66, that the language is different in the two sections, and that there are two different views of the Messiah between the first part of Isaiah and that written by the alleged Deutero-Isaiah. Ultimately, they do not believe that Isaiah could have written about Cyrus the Great in 700 BC. They cannot believe that the precise information in that prophecy could have been penned 150 years before it came to pass. These criticisms can sound scholarly on the surface, but they depend far less on evidence than on a bias against predictive prophecy. While these scholars may believe that a bias against the supernatural - and the power of God to speak through His prophets centuries in advance - is scientific in this modern world, the truth is, it's still a bias. It's still just their opinion based on a humanistic worldview. The Dead Sea Scrolls: An entire copy of the book of Isaiah was found in the Dead Sea Scrolls. There is no separation between Chapters 1-39 and 40-66. In fact, chapter 40 starts on the last line of the same column that ends chapter 39. As Oswald Allis notes, "Obviously the scribe was not conscious of the alleged fact that an important change of situation, involving an entire change of authorship, begins with chapter 40." Isaiah's Hebrew: Throughout all 66 chapters, Isaiah uses pure Hebrew. Unlike Ezra and Nehemiah, which use terminology adopted from Babylon, Isaiah's Hebrew is free from the vocabulary that the Jews gained during the exile. Topography: The description of the topography in Isaiah 40-66 is the rocky mountainous land of Judah and not the flat alluvial Fertile Crescent. For instance, 57:5-6 describes the "clifts of the rocks" and the smooth stones of the streams. Themes: Certain themes and terminology are repeated throughout the book. The "highway" theme comes up repeatedly (11:16; 19:23; 35:8; 40:3; 62:10). Isaiah refers to God as "Lord of hosts" repeatedly throughout the entire book. "The Holy One of Israel" is Isaiah's distinctive name for God used 12 times in chapters 1-39 and 14 times in chapters 40-66. The phrase is only used six other times in the Bible outside of Isaiah. The significance of idolatry: Idolatry was a major problem in Judah before the exile, but the post-exilic writers Haggai, Zechariah, Ezra, Nehemiah and Malachi do not mention idolatry even while discussing the nation's other sins. Yet, in the latter end of his book, Isaiah continues to speak strongly against idolatry (41:29; 44:9-20; 57:4ff; 65:2-7), indicating an early authorship. The by-line: Only Isaiah, son of Amoz, is named as the author throughout the book of Isaiah, at the beginnings of chapters 2, 7, 13, 20, 38, and 39. No other author is mentioned at all. Even when Ezra and Nehemiah were bound together, those two books did not get confused and lumped together under Ezra. Yet, "Deutero-Isaiah" was allegedly lost to history. Chapters 40-66 contain some of the highest quality literature in all of written history, yet we are expected to believe that this writer went mysteriously unrecognized until he was "discovered" by recent scholarship. As Gleason Archer Jr. declared, "There is not a shred of internal evidence to support the theory of a Second Isaiah, apart from a philosophical prejudice against the possibility of predictive prophecy." Isaiah is an amazing book, filled with the power and passion of God. In it He declares, "I am God, and there is none else; I am God, and there is none like me, Declaring the end from the beginning, and from ancient times the things that are not yet done, saying, My counsel shall stand, and I will do all my pleasure:" (Isaiah 46:9-10).